On Friday 3 and Saturday 4 June Metropole Orkest and the band Tin Men and the Telephone will meet for concerts in De Hallen Studio’s in Amsterdam. Or to be exact… interactive concert experiences in which audience participation and improvisation play distinct roles. Tin Men and the Telephone is an Amsterdam based band that employs live electronics, projected visuals, and audience participation in combination with jazz and improvised music to create a one of a kind multimedia experience. They have developed their own smartphone app “Tinmendo”, which allows audience members to actively take part in the performances in real time. For example by voting on what direction the music should take next, by creating beats for the band to play around with or by controlling the stage lighting. This app will be the focus point for the collaboration between Metropole Orkest and Tin Men, the underlying tech is being revised to facilitate influencing a full orchestra. With that the concert will not just be in the hands of Tony Roe and MO chief conductor Jules Buckley, the audience will play a vital part! It will be able to create chords, melodies and rhythms for the ensemble to improvise on. Tin Men and the Telephone, Metropole Orkest and the audience will feed off each other’s ideas and are connected to the one piece of technology that is equally loved and hated, the smartphone. In short, the motto for this project: Keep your phones ON! The app can be downloaded via www.tinyurl.com/tinmendo. This project has been made possible with financial support by ‘Toekomstmuziek!’, a program by Fonds 21, and the Creative Industries Fund NL. Founded in 2009, Tin Men and the Telephone consists of band leader/pianist Tony Roe (NL), bassist Pat Cleaver (UK/FR) and drummer Bobby Petrov (BGR). Tin Men and the Telephone have performed at major festivals and venues across Europe and the world at large, including the North Sea Jazz Festival, London Jazz Festival, Jazzahead, BMW Welt Jazz Awards Finals, Gateshead International Jazz Festival, Ottowa Jazz Festival, Toronto Jazz Festival, Moods, Nasjonal Jazzscene Victoria, Dokkhuset, Amman Jazz Festival, Istanbul Jazz Festival, Tremplin Jazz d’Avignon, Unterfahrt, Jazztage Dortmund Domicil, Alte Feuerwache Mannheim, Konstanzer Jazzherbst, Jazzmeile Thüringen, Jarasum International Jazz Festival, Bimhuis, Muziekgebouw aan t IJ, Vortex and many many more. 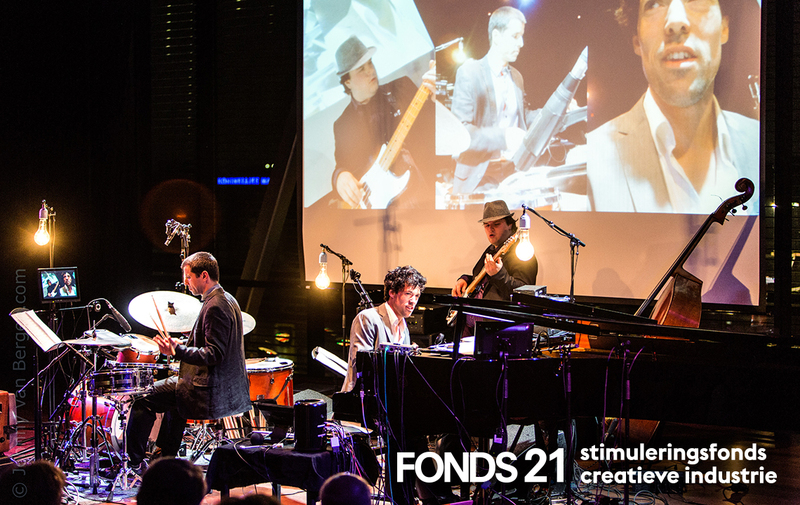 They have been nominated for the Jazz FM Awards 2016 – Digital Initiative of the Year.